Ask fellow campers about "Elk Point City Park and Campground" and nearby attractions. This is a city park with several RV hookups. Electric service at each site with a metal picnic table. 2 water pumps on site. Highway 29 is fenced off in the distance. We brought our dogs and it was great for them. There is a trash dumpster. There are about 4 shady spots. Rest are open. You can hear highway noise but very private from highway. We stayed overnight and really enjoyed it. There is a convenient store at the exit nearby. Drive through town, then down a residential street to get to the park. Coming from the south there is a HyVee grocery store about 20 minutes away. We stopped on the way in and there was plenty of parking there too. $10 per night. We camped at Elk Point City Park and Campground in a Travel Trailer. 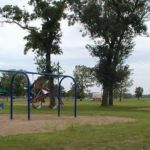 Enjoy the small town with a walking trail, playground, frisbee course, baseball field, a park, a school, and a nursing home within steps of campsite. Grass area, but we were able to level easily. Shower house was just OK. Trash at the park shelters, and cardboard recydling only. Easy access from the I-29, but surprisingly quiet. Next to a sports field so might have to deal with noise and lights on some weekends, but the Friday before Labor Day nothing was going on. This a city park, so there is a nice playground for the kids. A few monthly parkers, but $10 for electric and sewer is a steal. No dump station, but that wasn't a problem for us. We camped at Elk Point City Park and Campground in a Motorhome. 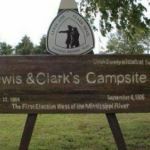 Are you affiliated with Elk Point City Park and Campground ?